From Phil Ochs the path leads to a little known treasure from 1965. 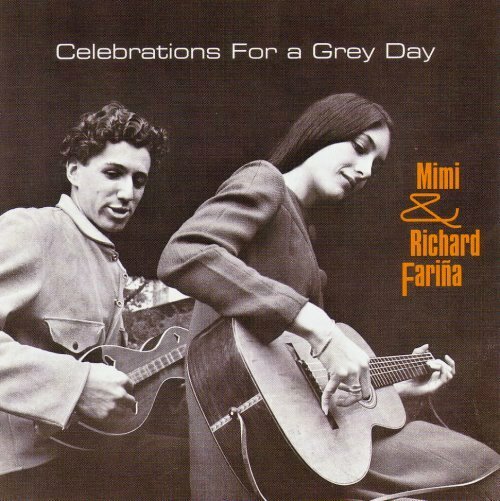 Richard Fariña married Joan Baez's sister Mimi in 1963 and Celebrations for a Grey Day was their first album. The vocal tracks are Dylan-lite, which is not a problem, but the real beauty of the album lies in its six instrumental tracks scored for autoharp, dulcimer and guitar. Richard Fariña died in a motorcycle accident a year after Celebrations for a Grey Day was released. Read about his novel It Looks Like Up to Me here, and more on Richard, Mimi and Dylan here. The autoharp and dulcimer are members of the zither family as is the kithara and there is new music for the kithara on another path. I still sing Fariña's "Pack Up Your Sorrows", which most of us heard the first time via Judy Collins, because people really like it and it somehow encourages folks to sing along in harmony more than most songs. It's one of those songs that was new in the 60's, but sounded as though it had been around forever. Back in the day Carly Simon had a folk group with her operatic sister, and they recorded a really good album for...Disneyland Records! That label has an amazing back catalogue from the 60's NONE of which has ever been re-released. richard and mimi---arguably the loveliest persons from the sixties----also wrote my favorite song----CHILDREN OF DARKNESS, which is on this, or on Celebrations for a Grey Day"
Richard and Mimi---arguably the most lovely of people, also did Refections in a Crystal Wind, and the song CHILDREN OF DARKNESS-----a fantastic song, which Baez sang, with an incredible arrangement by Peter Schickele that was an orchestra of bagpipes----music to die for. More folk arrangement trivia, or maybe not so trivia, which also links to Lyle's comment. Joshua Rifkin wrote orchestral arrangements for three of Judy Collins' albums, In My Life, Wildflower and Whales and Nightingales. It was Rifkin's 1972 recording of the B minor Mass that pioneered the 'one voice per part' approach to Bach. In My Life includes a setting of Francesco Landini's Ecco la Primavera that uses sackbuts, viols, and a harmonium. Her 1967 version of Joni Mitchell's Both Sides Now on Wildflower was a major chart hit for Judy Collins. On it Joshua Rifkind conducts his own arrangement and plays harpshichord. Judy Collins was a student of Antonia Brico, the first woman to conduct the Berlin and New York Philharmonic Orchestras. I'd discovered Rifkin was from the "classical" world, and I think it was the Landini that got me to investigate, but didn't realize he'd been behind the "one voice per part" approach. Given your recent posts, syncretism, or at least a blend of styles, comes to mind as part of the reason the music of that era was so exciting to us then. Simon and Garfunkel had a "classical" take on a "Benedictus" on an early album that was wonderful. I know it's a geezer thing to say, but I'm profoundly grateful to have come of age in such a rich musical environment. Thanks for that link. Man, oh man, don't it all come back. One reason I've never popped for satellite broadband is the fear of becoming a Proustian recluse, both reliving what I knew then and following paths I didn't back then because there were so many inviting ones. Didn't find Steeleye Span until about ten years ago. Simon's whiff of a British accent reminded me he was over there for a while and picked up "Angie" by Bert Jansch. I think this clip and some of the Rifken stuff was the first time I'd heard early music as living music, not as an academic LP with clinical examples of things. Speaking of multiple paths and some not followed, was always sorry S & G never went further down this one, that Judy Collins never went further down the one opened up by that amazing a capella version of "Amazing Grace" and that Ian & Sylvia never did more in the vein of "Jesus Met the Woman at the Well". "Time it was, And what a time it was . . . "